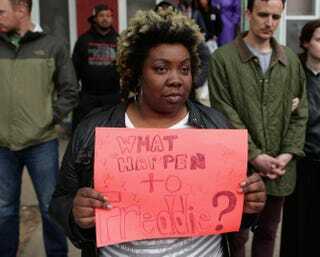 A demonstrator from Baltimore’s Sandtown neighborhood holds a sign seeking answers in the death of Freddie Gray, across the street from the Baltimore Police Western District station, during a protest against police brutality and Gray’s death. A man who is currently in prison but shared the police van with Freddie Gray when the 25-year-old Baltimore man was arrested April 12, claims that Gray was "banging against the walls" of the van, trying to intentionally injure himself, according to a report in the Washington Post. Gray died a week after his arrest from injuries suffered while in police custody. According to police documents viewed by the Post—documents that were provided to the newspaper under the condition that the prisoner would not be named out of fear for his safety—Gray and the unnamed prisoner were held in separate compartments inside the same van. In the document, the prisoner claims he couldn't see Gray but could hear him banging against the side of the van. Many have speculated about exactly what happened during Gray's 40-minute ride, with some arguing that Gray was a victim of a "rough ride," in which police place a cuffed prisoner inside a van without securing the prisoner safely with a seat belt. The unnamed prisoner's version of events is the first glimpse into a possible police version of what happened during the ride inside the van. The Post notes that "local police and the U.S. Justice Department both have launched investigations of Gray's death." "We disagree with any implication that Freddie Gray severed his own spinal cord," Jason Downs, one of the Gray family's attorneys, told the Post. He added: "We question the accuracy of the police reports we've seen thus far, including the police report that says Mr. Gray was arrested without force or incident." According to the Post, the investigation by Baltimore police is expected to conclude Friday, and the results will be turned over to the state attorney's office in Baltimore, "which will decide whether to seek an indictment." Six police officers, including a lieutenant and a sergeant, involved in the arrest of Gray and the subsequent van ride have been suspended with pay.